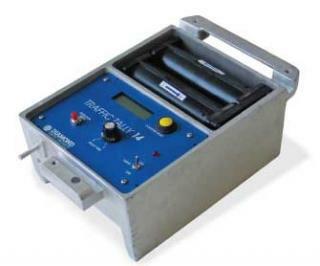 Traffic Tally 14 is an ultra low power, solid-state electronic grand total accumulator encased in a watertight cast aluminum enclosure to prevent damage should it become submerged. This allows placement of the counters in wet, low-lying terrain or near lakes and rivers. CASE IP67 Cast Aluminum with a built-in Cam Lock, or lid and counter case may be drilled to accept a 1/4” diameter shackle padlock. POWER 8 akaline "D" cell batteries. Battery life approx 18 months. To enable a counter to register one count per vehicle, a time delay feature is useful. A properly set time delay will eliminate multiple counts from truck and trailer, and still count a vehicle close behind. The TT 14 time delay is user adjustable from 0.1 to 4 seconds. A delay period light is provided to show the length of delay. The Loop Detector circuitry in the Traffic Tally 14 will automatically tune to loops having an inductance between 50 and 500 microhenries. Tuning time is one minute. The TT 14 runs on 8 alkaline ‘D’ cell batteries. The battery compartment, like the electronic counter compartment, is watertight. Battery life is approximately 18 months. Eight digit all solid-state counter, Resettable to Zero. Eliminates the need to subtract the previous reading. Batteries can be changed without losing your count. A standard M.S four-terminal connector is provided for loop input and external output to trip surveillance devices. External trip is via open collector to ground. The TT 14 is enclosed in a cast aluminum 6 3/4” x 10” x 4 3/4” water tight case with lockable cover latch. Counter can be ordered with a built-in Cam Lock, or lid and counter case may be drilled to accept a 1/4” diameter shackle padlock. An optional Display Viewing Window can be installed in the TT14, allowing the operator to read the count without having to open the lid.